Host your next gala in Atlanta’s most elegant gala venue – Cobb Energy Performing Arts Centre. 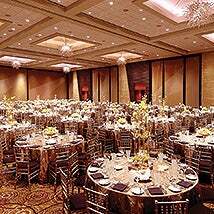 We have a wide variety of ballroom, dining hall and banquet hall options for all of your high society and black-tie gala events, including fundraisers, social gatherings, receptions and more. Plan on a breathtaking gala, and count on Cobb Energy Performing Arts Centre to provide world-class facilities and a friendly, professional staff offering relentless attention to detail and a make-it-happen mindset.